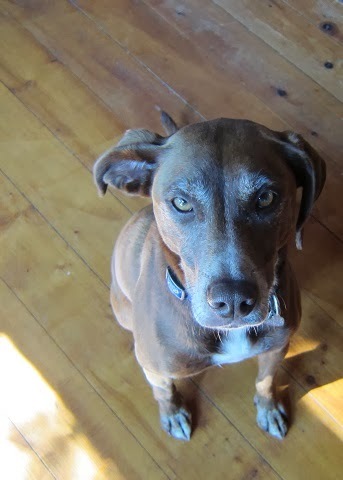 Roxy is a roughly four-and-a-half-year-old female who was advertised as a lab/pointer mix. As with most of us Americans who aren't pure-bred, it cannot be the entire story. 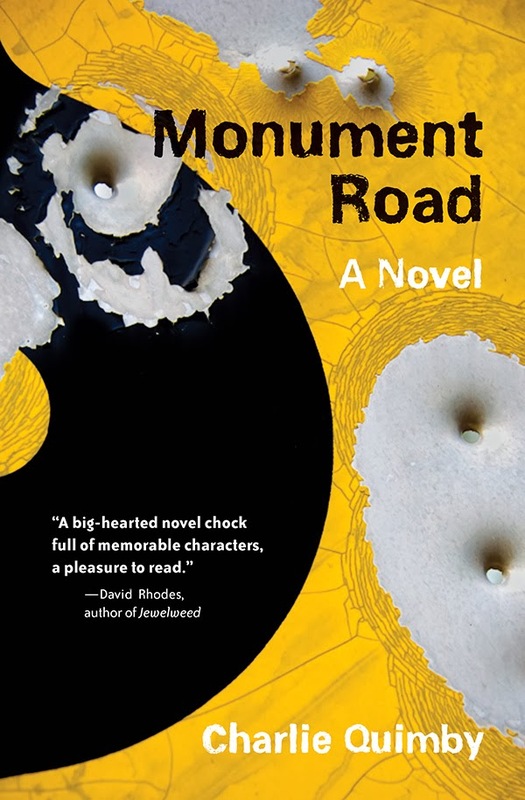 Charlie Quimby is a writer and author of the novel, Monument Road. 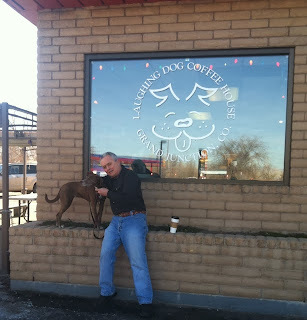 Laughing Dog Coffee House in Grand Junction is located on Monument Road and I pass it by every time I go into town. My regular stop there is Thursday mornings on the way to my volunteer gig (where the coffee's free but weak). Today, I brought Roxy along for errands and a walk in a new place. Normally, I go for volume and darkness. This time, since I'd already consumed 2/3rds of a pot at home, the "coffee" is actually a chai skim latte. Any treats for you or Roxy on this occasion? Roxy got a couple treats for jumping up on the planter for the picture. She has a year's supply for winning an Average Dog Trick contest in Minneapolis last summer, so we have to dole them out or she'll lose her girlish stunt dog figure. How did your dog get her name? Any nicknames? The name just jumped in my head when my wife and I were taking her home. (Roxy is semi-officially Susan's dog and I am assistant owner.) Nicknames include Rox and Sweetie, both of which are subject to misunderstanding when we go out in public. Kid: "Your dog's name is Rocks?" Woman: Silent glare at the man standing nearby who says, "Hey, Sweetie." How were you and Roxy united? Roxy was a mange-afflicted seven-month-old adopted from the Animal Humane Society in Minnesota. She was among the first 2,000 dogs who've made the trip all the way up from Oklahoma through a rescue program called Save Our Strays. Are there any dogs in your fiction that are inspired by Roxy? 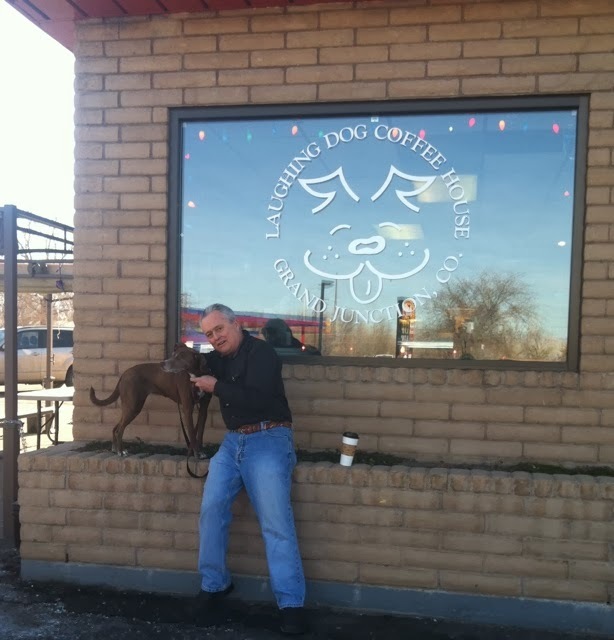 A ranch dog plays an important minor role in Monument Road, and a drug dealer's pit bulls also put in an appearance. But those dogs are too obedient to have been inspired by Roxy. Does Roxy do more to help or hinder your writing? She helps tremendously because my wife and I are both retired, and Susan takes her for a long walk each morning, which guarantees a daily period of quiet in the house. Now Susan's got a book project going and I'm going to have to pay her back for some of those days. (I mostly handle night and some afternoon walks.) It'll mean I have to structure my time differently, which isn't a bad thing. Who are Roxy's best pet-pals? 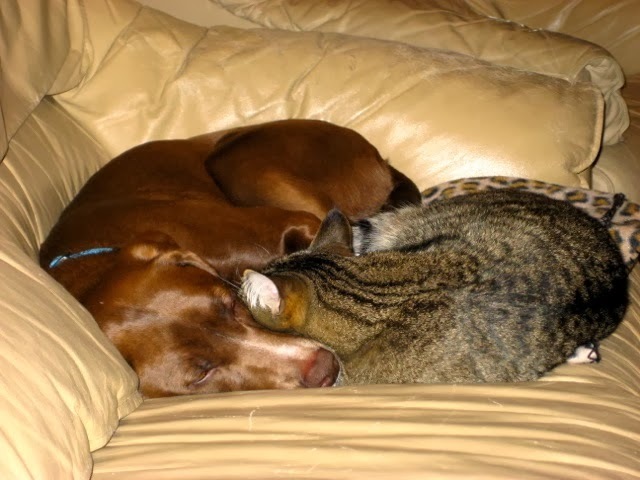 In Minnesota, it's Simba, one of our two cats who is utterly unintimidated by Roxy's desire to play. When we're in Colorado, it's Panda, my sister's mini-Aussie who lives next door and is more inclined to wrestle. Where is Roxy's favorite outdoor destination? She's fortunate to have so many options, but it's probably a beach on Lake Michigan in Door County Wisconsin where Susan's family has a cottage. She gets to swim, run full out, dig without ceasing and gobble the occasional rotting fish. She needs no props in order to play, and she's a chaser but not much of a returner, so her ball functions mainly as a pull toy. She keeps a nylabone next to her bed like a pack of cigarettes. In a yard full of oaks? Squirrels, definitely. What is Roxy's best quality? Beauty that's more than skin deep. She attracts attention but then knows what to do with it in a particular situation. I think she won the pet trick contest in part because she was the only dog who spontaneously schmoozed the judges. If Roxy could change one thing about you, what would it be? She would have me running again, so our walks would have a more vigorous pace. When she's off-leash and decides to lay it out, she's a sight to behold. If Hollywood made a movie about your life in which Roxy could speak, which actor should do her voice? Roxy has too much taste to be in a movie that features a fake talking dog. And she would insist on doing her own lines and her own stunts. That would be in the contract. If Roxy could answer only one question in English, what would you ask her? "Describe fully how you experience time." I'd want to learn about her months in Oklahoma, but maybe dogs don't experience time as a narrative of past and present. I'm interested in how that short dog's lifespan feels in comparison to a longer human one. In particular, I'd want to know about her perception of the future beyond the next few minutes and what life's like without an awareness of one's mortality. Such a smart girl, Roxy! 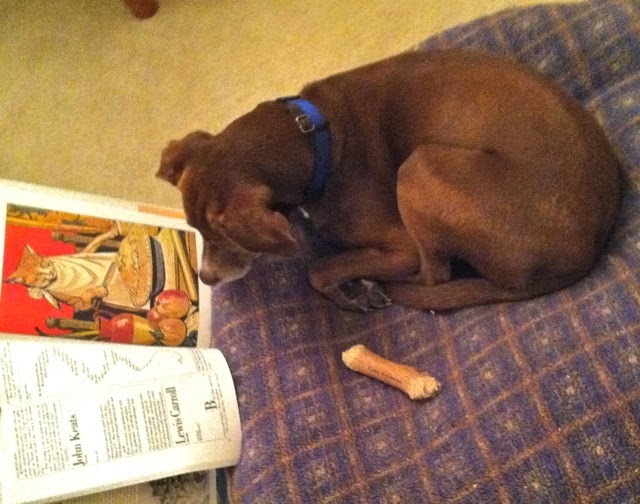 Is that cookbook you are reading showing any recipes for cats in gravy, or does it just show how to make food for cats?